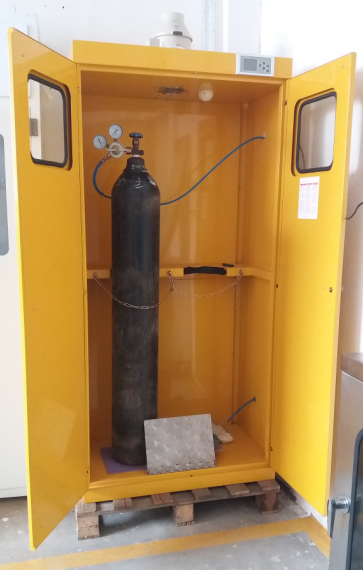 Two gas bottles yellow color safety storage cabinet which can hold two pcs of gas cylinders with sensor and alarm system, sound alarm, alarm light and automatical exhaust fan work. 1.2mm thickness double walls construction. Adjustable stainless steel chains to fix the bottles very well. Transparent anti-explosive glass for windows. The capacies are available for one gas cylinder storage cabinet, two gas cylinder safety storage and three gas bottle safety storage. Meanwhile, alarm system without exhaust fan is also acceptable.